Liao, H. and Hung, M. (2017). Intracaecal Orthotopic Colorectal Cancer Xenograft Mouse Model. Bio-protocol 7(11): e2311. DOI: 10.21769/BioProtoc.2311. The host microenvironment plays a prominent role in tumor growth, angiogenesis, invasion, metastasis, and response to therapy. Orthotopic tumor model mimics the natural environment of tumor development and provides an effective approach to investigate tumor pathophysiology and develop therapeutic strategies. 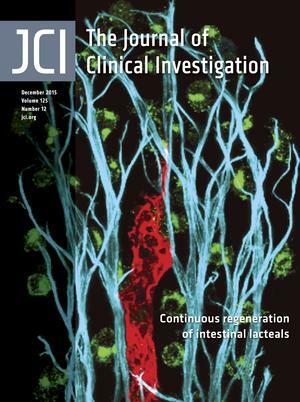 This protocol describes the technique involving injection of colorectal cancer cell suspension into the intestinal wall of mice to establish an orthotopic colorectal tumor model. Various murine models have been developed to facilitate studies of human cancers and allow better understanding of mechanisms contributing to tumor growth. While heterotopic xenograft models involve implanting cancer cells into the flank of immunocompromised mouse subcutaneously, orthotopic tumor models more closely resemble the original tumor development due to the implantation of tumor cells directly into the organ of origin (Richmond and Su, 2008). Although orthotopic xenograft models are technically challenging and labor-intensive, orthotopic transplants are able to more accurately mimic human tumor and better predict a patient’s response to chemotherapy in comparison with heterotopic transplants because of the effects of tumor microenvironment (Talmadge et al., 2007). With increased knowledge regarding the important role of tumor-host cell interaction during tumor progression, genetically engineered mouse (GEM) models using immunocompetent mice extend our ability to model the complexity of human cancers (Gopinathan and Tuveson, 2008; Zitvogel et al., 2016). However, GEM models are more expensive, often require months to a year to develop tumors, and have the drawbacks regarding the heterogeneity of tumor frequency, latency and growth. By contrast, xenografts are less expensive, require less time to establish tumors, and have better reproducibility (Vandamme, 2014). In this protocol, we describe the procedure of generating orthotopic colorectal cancer by injecting human cancer cells into immunocompromised mice (Tseng et al., 2007; Liao et al., 2015). Autoclave forceps, surgical scissors, wound closure applier and clips prior to procedure. The entire surgical procedure is to be carried out under a sterile hood. Clean surgical equipment with Virkon® disinfectant cleaner between mice. Trypsinize 80% confluent colorectal cancer cells, e.g., HT-29 and HCT116, and wash cells with PBS, centrifuge at 200 x g for 5 min at 4 °C. Discard supernatant and repeat the wash step three times. Keep cells (5 x 106-1 x 107 cells in 50 μl PBS) on ice and check cell viability before injection. Example: For 10 injections, prepare at least 12 x 5 x 106 to 12 x 1 x 107cells in 12 x 50 μl PBS. Administer buprenorphine pre-operatively (0.1 mg/kg, subcutaneously) 10 min before surgery. Inject mice with Avertin solution (0.5 ml/25 mg mouse) or ketamine/xylazine/acepromazine (0.2 ml/20 mg mouse) intraperitoneally to anesthetize the mouse before surgery. Check hind limb reflex by pinching foot to make sure that mice are asleep. Induction time is around 1-2 min. Surgical anesthesia lasts approximately for 15-45 min with a sleep time of 60-120 min if Avertin is used. Note: Surgical anesthesia lasts approximately for 30-40 min with a sleep time of 60-180 min if ketamine/xylazine/acepromazine is used. Preparation of animals: 1) Remove hair (if SCID mice are used) from the surgical area by using a trimmer/clipper; 2) apply betadine in a circular fashion starting at the surgical incision and rotating outward; 3) alternate betadine with 70% alcohol; 4) repeat three times, discard cotton pad after each use; 5) Before surgery, apply ophthalmic ointment to both eyes to prevent desiccation; 6) before starting, cover the rodent with sterile drape to avoid contamination of the incision; 7) during surgery, use thermal pads to maintain normal body temperature. Place the animal in ventral recumbency. Make a 0.5-inch long midline skin incision along the lower abdomen around 1 cm anterior to the genital by a pair of forceps and surgical scissors. The body wall is then incised in the same length. Gently pull out cecum and ascending colon from the incision. Keep the exposed cecum and ascending colon moist with 0.9% sodium chloride during the entire procedure. Note: Make sure that bubbles are removed from the cell suspension. Figure 1. Schematic diagram of mouse gastrointestinal tract. 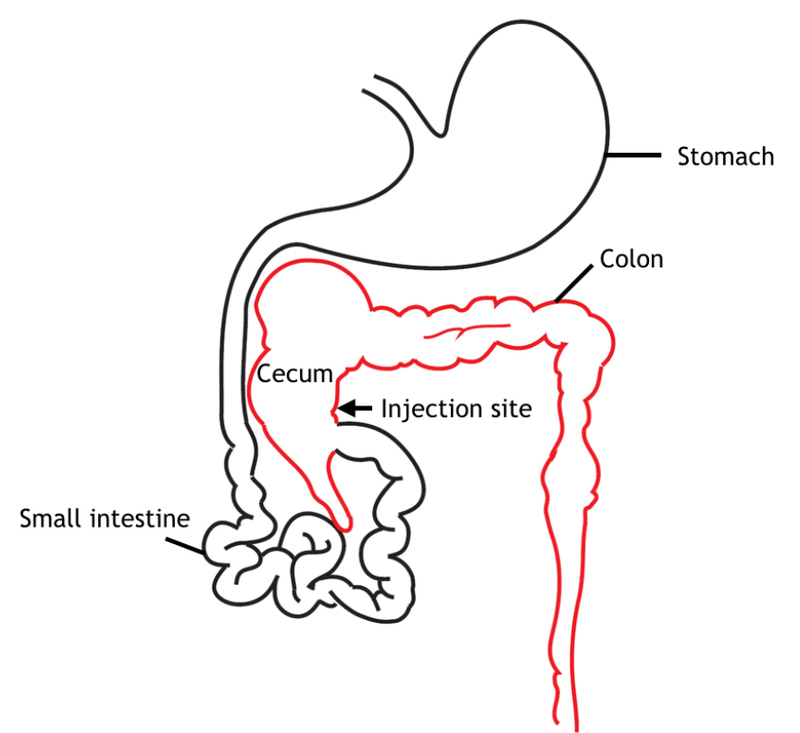 Cecum and the injection site are indicated in the diagram. Place cecum and ascending colon back into the abdominal cavity. Note: Be careful not to squeeze the injection area. Suture abdominal muscle layer, and then close the skin by wound clips. Keep mice warm under heat lamp until the mice recover from anesthesia. The lamp should be kept 12-14 inches away from the mouse and attentive monitoring should be performed to prevent overheating. Surgical heating pads or a temperature-controlled cage/incubator can be used as alternatives. Mice should be monitored until maintaining upright posture and walking normally before returning to the animal housing room. Administer buprenorphine post-operatively (0.1 mg/kg, subcutaneously in one 72-h injection) as needed. Check mice every day following surgery for infection or signs of pain. Antibiotics may be used if infections occur. Remove clips by wound clip remover after 7-10 days once the incision has healed. One month after surgery, tumors can be harvested to measure tumor weights and tumor volumes. However, the tumor growth rate and tumor volumes depend on the cell lines that are injected. Tumor diameters are measured by a digital caliper, and the tumor volume (mm3) is calculated by the formula: Volume = (width)2 x length/2. Tumors can be further confirmed by immunohistochemical staining for Ki67/haematoxylin after resection. In addition, depends on availability of equipment and reagents, small animal imaging instrumentations, including x-ray computed tomography (CT), magnetic resonance imaging (MRI) or bioluminescence imaging, are useful tools to non-invasively measure burden of xenografted tumors. Lymph node, liver, and lung metastases can be further examined by bioluminescence imaging (if cells contain luciferase) or by microscopic analysis after Ki67/haematoxylin staining within 16 weeks after injection. At least five mice are recommended for each group. A P value < 0.05 is considered as significant using Student’s t-test. However, the number of mice to be used depends on the hypothesis tested and on the statistical test. A power analysis should be done prior to the start of the experiment. Complete the injection as soon as possible after the cells are trypsinized. Ideally, cells should be injected within one hour after trypsinization. Colon cancer cells aggregate easily. Ensure cells are completely separated when calculating the cell numbers for injection in order to reduce the variations between different mice. Yellowing of the Avertin solution indicates toxic degradation. Discard the solution when it turns yellow. NIH and European guidelines discourage the use of Avertin. The use of Avertin must be justified and approved by The Institutional Animal Care and Use Committee (IACUC). Alternatively, ketamine/xylazine/acepromazine cocktail is another commonly used injectable anesthetic agents. Make fresh mixture and use the ketamine/xylazine/acepromazine cocktail within one week, as the is mixture are not stable and may lose potency. Ketamine/xylazine in combination with NSAID prior to surgery or addition of acepromazine will augment the anesthetic effect of ketamine/xylazine. This work was supported by NIH (CCSG CA16672); Cancer Prevention and Research Institute of Texas (RP150245); The University of Texas MD Anderson-China Medical University and Hospital Sister Institution Fund; Ministry of Science and Technology, International Research-intensive Centers of Excellence in Taiwan (I-RiCE; MOST 105-2911-I002-302); Ministry of Health and Welfare, China Medical University Hospital Cancer Research Center of Excellence (MOHW106-TDU-B-2 12-144003). This protocol was adapted from previous work published in the Journal of Clinical Investigation (Liao et al., 2015). Gopinathan, A. and Tuveson, D. A. (2008). The use of GEM models for experimental cancer therapeutics. Dis Model Mech 1(2-3): 83-86. Liao, H. W., Hsu, J. M., Xia, W., Wang, H. L., Wang, Y. N., Chang, W. C., Arold, S. T., Chou, C. K., Tsou, P. H., Yamaguchi, H., Fang, Y. F., Lee, H. J., Lee, H. H., Tai, S. K., Yang, M. H., Morelli, M. P., Sen, M., Ladbury, J. E., Chen, C. H., Grandis, J. R., Kopetz, S. and Hung, M. C. (2015). PRMT1-mediated methylation of the EGF receptor regulates signaling and cetuximab response. J Clin Invest 125(12): 4529-4543. Richmond, A. and Su, Y. (2008). Mouse xenograft models vs GEM models for human cancer therapeutics. Dis Model Mech 1(2-3): 78-82. Talmadge, J. E., Singh, R. K., Fidler, I. J. and Raz, A. (2007). Murine models to evaluate novel and conventional therapeutic strategies for cancer. Am J Pathol 170: 793-804. Tseng, W., Leong, X. and Engleman, E. (2007). Orthotopic mouse model of colorectal cancer. J Vis Exp 10: 484. Vandamme, T. F. (2014). Use of rodents as models of human diseases. J Pharm Bioallied Sci. 6(1): 2-9. Zitvogel, L., Pitt, J. M., Daillère, R. and Smyth, M. J. (2016). Mouse models in oncoimmunology. Nat Rev Cancer 16:759-773. How to cite: Liao, H. and Hung, M. (2017). Intracaecal Orthotopic Colorectal Cancer Xenograft Mouse Model. Bio-protocol 7(11): e2311. DOI: 10.21769/BioProtoc.2311.